Let's get the ugly stuff out of the way now. 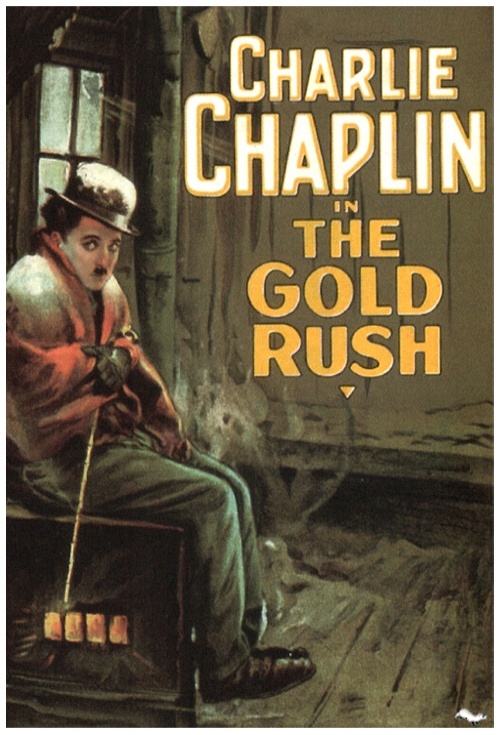 Charlie Chaplin's 1925 comedy, The Gold Rush, was filmed in... California. Like many films of its era, most of the film was quite obviously set on studio sets. But the setting of the film is the Klondike Gold Rush in Alaska, and many of the elements of the story would be elements of Alaskan films for decades to come: the Gold Rush itself, the harsh winter, the unforgiving wilderness, bears, sled dogs, dance hall girls, and the humor that is necessary to survive in the Land of the Midnight Sun. There are no explicit religious elements in the film, which is not surprising. 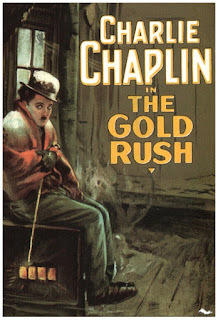 It was written and directed by Chaplin, who was not (by all accounts) a religious man. But the Little Tramp's spirit of gentleness and humility is very Christlike indeed. Anthony Mann and actor James Stewart made a series of classic Westerns in the 1950's. One of those films was 1954's The Far Country, about cowboys who tried to make their fortune shipping cattle to Alaska in 1896, the beginning of the Gold Rush. Like all their collaborations, this Mann/Stewart Western is exciting and much tougher than most action films of its time. Sadly, it was filmed in Canada. The Spoilers, a 1942 John Wayne Western, is set in Nome, Alaska, during the Gold Rush. 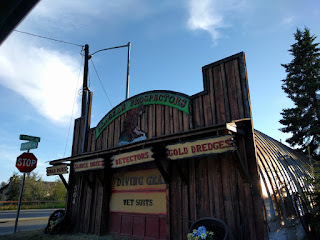 It tells the story of prospectors protecting their claim against crooked authorities. The tag line of the film was "Crashing Fists in the Gold Crazed Alaska of '98!" But is was filmed in California. The Gold Rush is not the only time a great comedian used an Alaskan setting. Bob Hope and Bing Crosby made a series of "Road" comedies notable for a breaking of the fourth wall. In Road to Utopia, like other films in the series, Dorothy Lamour provided the love interest. The film was made in 1943 but wasn't released until 1946, perhaps delayed because of World War II and perhaps to benefit Crosby's campaign for Best Actor for Going My Way (1944). Growing up, one of my favorite things was watching Abbott and Costello comedies early on Sunday mornings before my family headed off for church. One of those films was 1952's Lost in Alaska. But like the film of other famous comedy team just mentioned, their film was made in California. John Wayne returned to an Alaska setting in 1960's North to Alaska about a man who is supposed to bring his friend's mail order bride but, due to comic complications, must substitute a dance hall girl (played by Capucine) for the expected bride. Again, filmed in California. In a Fairbanks, Alaska, museum we saw a large poster for 1943's Klondike Kate, in which Ann Savage starred as a true life dance hall girl with a notorious reputation. It was directed by William Castle, who would later make a reputation with cheesy horror films. I couldn't find out anything about where this film was made, so it probably wasn't made in Alaska. There have been a number of films about sled dogs, and Disney couldn't stay out of the game. 1994's Iron Will tells the story of a kid who must win the big race. No spoilers about whether he wins the big race. And it was filmed in 'M' states, Minnesota and Montana. There isn't even a question about 1995's Balto being filmed in Alaska because, well, it's animated. It is based on a true story a diphtheria epidemic in 1925 Nome. A team of sled dogs brought the needed serum to the town, the team led by a dog named Balto. On the cheerier side, in the 1996 film Alaska, kids lost in the wilderness find a polar bear cub that takes care of them. The film stars Charlton Heston and was directed by the actor's son Fraser. We had fun taking our kids to the film when it came out, but few others have seen it. And it was filmed in Alaska (and Canada). The Gold Rush is a comedy, so it gets a little dark, but not too dark. Things do not go so well in The Grey, the story of a group of oil workers who survive a plane crash in the Alaska wilderness, This very good but somber film that some refer to as Liam Neeson Vs. Wolves (Things go better for wolves than things usually go for people who abduct Liam's daughter) was filmed in Canada. Sean Penn directed the 2007 film, Into the Wild, which tells the true story about a young man who decided to live in the Alaskan wilderness. Things did not go well. But we'll finish with good news: the Alaskan portions of the film were filmed in Alaska, including the Mecca bar in Fairbanks.